You’ve almost certainly seen the results of landscape fragmentation. Look out an airplane window almost anywhere in the world and you’ll see small patches of forest or grassland surrounded by fields or houses. This is fragmentation – the breaking apart of natural lands, habitat, and ecosystems into smaller pieces, usually because of human activities. Agricultural expansion, urban growth, road construction and the damming of rivers have all resulted in ecosystem fragmentation, with serious consequences for biodiversity loss. Human-dominated landscapes though, are not only managed for biodiversity; but also to provide benefits, or ecosystem services to people. Ecosystem services are the goods and processes from ecosystems that benefit human wellbeing. This includes material goods like food, timber, fibre and water; processes such as pollination, pest regulation, flood regulation and water purification; and more intangible benefits like aesthetic or spiritual fulfillment and opportunities for recreation or education. While the ecosystem-services perspective doesn’t please everyone (some suggest it ‘commodifies’ nature), there is no denying that humans rely on ecosystems for their wellbeing. In turn, the generation of ecosystem services often depends on biodiversity and when species are lost from ecosystems the production of ecosystem services can decline. As human activities fragment landscapes, how might this affect ecosystem services? We tried to answer this question by thinking broadly about how landscape fragmentation might affect services. Our goal was to produce a new framework for thinking about the effects of landscape fragmentation in order to spur new research and understanding about these relationships in real landscapes. Knowledge in this area is critical if we want to manage landscapes to optimize ecosystem services and conserve biodiversity. The core of our framework is the idea that ecosystem-service provision depends on supply, demand and flow. First, an ecosystem has to be able to generate a potential benefit for people. There has to be some good (eg, timber, food), process (eg, water filtration, flood water retention), or experience (eg, recreation, bird-watching) that could potentially improve human wellbeing. In turn, there has to be a demand by people for that good, process or experience. Without a human need for timber, clean water, or recreational opportunities in a landscape, an ecosystem service can’t be realized. In other words, a person actually has to benefit before an ecosystem service is produced. Finally, people have to interact with ecosystems to gain a benefit. This interaction is what connects supply and demand and produces an ecosystem service flow. Flows occur when people harvest timber from a forest, drink clean water provided by an ecosystem, or pursue outdoor activities. For most services, flow depends on the movement of organisms, matter or people. As an example, think about a local park where people might go to bird watch. This service depends equally on the park’s capacity to support a diverse bird community (the supply) and the presence of people that like birds and don’t mind getting up early (the demand), but also on the ability of people to access the park to watch birds (the flow). If the park is remote, or doesn’t have easy access, then very little bird-watching will occur, despite the presence of different unique bird species and a local bird-watching community. Without a connection between the two, provision of this specific ecosystem service will be small or non-existent. 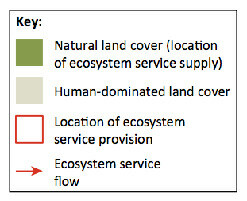 Other ecosystem services also depend on movement for a service flow to occur. For example, pollination of crops depends on pollinators being able to move from patches of forest or meadow into agricultural fields. Similarly, bio-control of crop pests depends on the movement of beneficial insects from nearby ecosystems into fields; drinking water supply on the flow of surface water or groundwater to areas where people can collect and consume it; fisheries on the movement of people to fishing locations; and recreation, educational and spiritual services on the ability of people to travel to and access natural ecosystems. Figure 1: Two possible effects of landscape fragmentation on ecosystem service provision. What we realized was that fragmentation can impact these flows both positively and negatively. An obvious effect of fragmentation is a reduction in the ability of organisms or matter to move across landscapes. In other words, the connectivity of the landscape for different species is reduced as a landscape is fragmented (Figure 1). Roads, pipelines, clear-cuts, housing developments, fields and other human disturbances often negatively affect the ability of organisms to move across landscapes. If this movement is key for an ecosystem service like pollination or seed dispersal, then fragmentation will have a detrimental effect. Similarly, fragmentation can also affect human movements, reducing our ability to interact with ecosystems. For example, dams fragment rivers and can reduce their potential for recreation. At the same time, fragmentation can also increase ecosystem service flow by increasing the interspersion of people and ecosystems. By putting areas of service supply and demand in closer proximity, service flows could increase. It is well known that small patches of forest or grassland interspersed within cropland can be effective at maximizing pollination or bio-control. Because pollinators and other insects only move specific distances across landscapes, small and regularly placed forest or meadow patches provide a more even distribution of these organisms than a single large patch. The same principles apply to human movement as well. More fragmented, but evenly distributed parks across cities can increase park access and visitation, with positive consequences for human health. These conflicting effects of fragmentation on ecosystem service flow mean that predicting how fragmentation might affect service provision is much more complicated than we might first expect (Figure 2). Figure 2: If landscape fragmentation negatively affects service supply (left panel) but positively affect service flow (middle panel), then complex patterns of ecosystem service provision with fragmentation can occur (right panel). While extreme levels of fragmentation will likely cause levels of biodiversity loss that will result in significant loss of ecosystem services, intermediate levels of fragmentation could help maximize service flow and provision where interspersion is important. For other services where landscape connectivity is key, fragmentation could rapidly drive service loss via the simultaneous loss of biodiversity and landscape connectivity. Realizing that fragmentation has these conflicting effects on ecosystem services in human-dominated landscapes is a significant shift in our thinking. The critical next challenge is to test this framework in real landscapes. We need information on the specific relationships between fragmentation and service provision, as well as the mechanisms that underlie these patterns across different services and types of landscapes. At the same time, we need to work on integrating this knowledge into decision-making. Land-use decisions at a variety of scales affect levels of fragmentation across human-dominated landscapes. A concerted effort is needed to integrate scientific understanding of fragmentation and service provision with landscape planning policies and mechanisms to ensure that we create sustainable and multifunctional human-dominated landscapes. Mitchell MGE, AF Suarez-Castro, M Martinez-Harms, M Maron, C McAlpine, KJ Gaston, K Johansen & JR Rhodes. (2015). 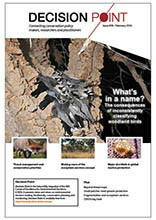 Reframing landscape fragmentation’s effects on ecosystem services. Trends in Ecology and Evolution 30: 190-198. This is a fascinating new perspective on human ecology, and one worth pursuing further as suggested. However one small concern. I wonder about the consequences of anthropocentric framing of the ‘functions’ which the ecosystem carries out as ‘services’. An ecocentric view might regard these functions as equally important to other members of our ecological community. Should we be as respectful of their needs as much as our own? Would a more ecocentric, biosensitive viewpoint help challenge the current socioeconomic paradigm which is creating the fragmentation in the first place and assist a better understanding of the place of humans in nature? You’re right, there are definitely some important consequences of thinking about things with an anthropocentric versus ecocentric view, especially when we’re talking in a species conservation sense. There is a lot of debate out there about these two views, and I could definitely point you towards some of it if you’d like. Our view is that for many human-dominated landscapes (agricultural and urban mainly), the vast majority of management decisions are (and likely will continue to be into the near future) made with respect to human needs and ecosystem services (e.g., crop production, pollination, recreation, etc). If this assumption is reasonable, then we need to make sure that we’re making decisions that will actually improve the provision of these ecosystem services. That’s also not to say that more ecocentric views are also needed and should inform management decisions, especially when we’re talking about the expansion of agricultural or urban areas into more natural areas. I think in a lot of cases anthropocentric and ecocentric views aren’t mutually exclusive and can inform and complement each other.